Posted by Andreas in Cape Town, Film screening, Politics, South Africa, Work. Wal-Mart: The High Cost of Low Price, an acclaimed documentary film that investigates the destructive impacts of the world’s largest retailer which is soon coming to South Africa, will be shown at the Labia on Orange cinema in Cape Town on Saturday 11 December at 12:00 noon. 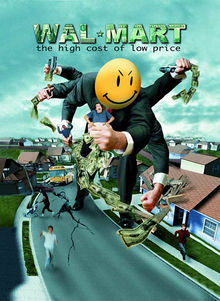 Wal-Mart: The High Cost of Low Price is a feature length documentary that uncovers the retail giant’s assault on America and the world by exploring the deeply personal stories and everyday lives of families and communities struggling to fight the goliath. A working mother is forced to turn to public assistance to provide healthcare for her two small children. A family loses its business after Wal-Mart is given over $2 million to open its doors down the road. A community in California unites, takes on the giant, and wins! Tickets are R10 and can be reserved by calling The Labia at (021) 424 5927. This is a once-off screening and we strongly recommended that you reserve tickets to avoid disappointment. Posted by Andreas in Climate change, Column, Environment, renewable energy, South Africa, Southern Africa. Eskom makes all of us energy colonialists. By buying electricity from a new hydroelectric dam in Mozambique it will continue to contribute to social and environmental degradation in one of the world’s poorest countries. In August, the government of Mozambique officially approved the construction of the Mphanda Nkuwa Dam which is to be built in the Zambezi River about 60km downstream from the existing Cahora Bassa Dam. The project is expected to cost between $2bn and $3.5bn and deliver 1 500MW of electricity with the potential of being expanded to 2 400MW. Construction, led by a consortium of Mozambican and Brazilian interests, is slated to start in 2011 and take five to six years to complete. As early as January the Mozambican newspaper Notícias reported that negotiations of long-term power purchase agreements with Eskom were expected to be concluded this year. Indeed, proponents of the new dam claim that it will attract energy-intensive industries to the country, but in reality, Eskom and power hungry South Africa are expected to consume some 90% of the electricity generated. Only about 5% of Mozambicans currently have access to electricity and half of those live in Maputo. The impoverished rural majority, much in need of electricity, will not see any of the power produced by the new dam. Contrary to popular belief, large hydroelectric dams frequently have devastating social and environmental impacts on rivers and the people and ecosystems that depend on them. In the case of Mphanda Nkuwa, more than 1 400 people are expected to be displaced by the dam and its associated infrastructure and social and environmental justice activists estimate that it threatens to compromise the livelihood of 100 000 to 200 000 subsistence farmers and fishers living downstream. In order to cater for periods of peak electricity demand in South Africa, the turbines in the dam will be required to operate intermittently, resulting in mini-floods twice a day and fluctuations in river level of 0.5 to 2.8 metres the effects of which will be felt hundreds of kilometres downstream. Rising flood waters will erode some of the most productive farmlands and riverbank gardens on which locals depend for their food security. The mini-floods will also threaten downstream sandbanks and other important habitats for various bird, invertebrate and fish species. The electricity generated by large hydroelectric dams isn’t even carbon neutral. Accumulating rotting organic matter which would normally be flushed downriver continuously causes the emission of significant quantities of greenhouse gasses. Neither is it renewable since the reservoirs tend to gradually fill up with sediment, depriving the river and its floodplains of nutrients while steadily reducing the dam’s capacity. What’s more, scientists predict that lower precipitation due to climate change will lead to reduced flow rates of the Zambezi, threatening the long-term viability of the project. All of this is old news. The UN has described the 2075MW Cahora Bassa Dam, built in 1974, as one of the most destructive major projects in Africa. Running at a financial loss, Cahora Bassa has caused reduced fertility and massive erosion downstream, led to the drying up of the Zambezi Delta, one of the continent’s most important wetlands, and contributed to a 60% decline in the important local prawn industry between 1978 and 1995. Efforts to restore the disrupted ecosystems of the lower Zambezi by changing the water release patterns from Cahora Bassa to mimic natural river flows more closely will be made difficult by the construction of Mphanda Nkuwa. Yet the Mozambican government approved the dam before the environmental impact assessment has even been completed, stating that it would have no identifiable impact of the Zambezi Delta or local fisheries.